The basil Cento Alu Basket is another essential choice that fits onto the rear of both men’s and women’s bicycles. Designed for permanent mounting, it’ll serve you well for years to come. The Basil Cento is a sensational choice of basket for any cyclist, designed to attach to the rear of your frame. Permanent mounting to your luggage carrier ensures maximums stability, while the modern style and slick finish ensures a fine complement to more contemporary frames. This striking basket is fashioned from authentic aluminium, while all mounting hardware comes included, saving you the expense of having to purchase them separately. A dependable choice in any weather, this basket will withstand the elements and is weatherproof. The impressive aluminium wire construction is another big selling point, instantly elevating your bike to new levels of style. 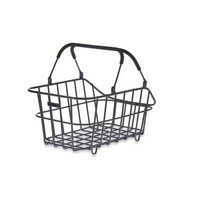 You can attach this basket lengthways onto your carrier, with fasteners and other essential hardware included to fully fasten this basket to your bike. Browse the complete range of Basil bicycle baskets, boxes and satchels online today. Designed for fixed mounting, with all essential hardware included. Suitable for mounting to luggage carrier. Sloping edges provide more leg room.